The Detroit motor show is the first opportunity in 2018 for vehicle manufacturers to showcase their new and upcoming cars. 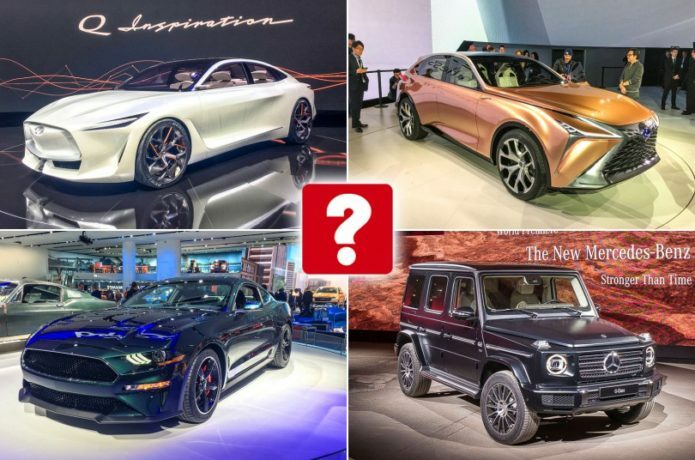 While the big focus in Detroit is on US manufacturers and the cars which will be sold there, there are also plenty of models which will be coming to the UK, as well as several concept cars which look further afield at future products and emerging technologies. The headlines this year are dominated by electric cars (plus trucks and SUVs) as well as the continuing march towards fully self-driving vehicles. Underneath the stylish lines of Lexus’ latest concept car lies a future range-topping SUV, which is targeted directed at the Range Rover and upcoming Audi Q8. The interior is largely free of buttons, with a central infotainment screen and digital driver’s display instead of analogue dials. The car’s infotainment and sat-nav system features so called ‘4D navigation’ and haptic feedback – which gives the impression of you pressing a button even on a flat touchscreen. The production version of the LF-1 is expected to be a global car for Lexus, meaning it will be sold with a variety of powertrains including plug-in hybrid and all-electric options. Lexus already has a large SUV, the RX, but we only gaive that car three stars on our road test. The Q Inspiration concept from Infiniti doesn’t preview a particular car, but its styling shows how the brand’s models will evolve in the future, and elements including its full-length glass roof, wide grille and slim lights at the rear could well be seen on the next generation of Infinitis. The concept is powered by the same 2.0-litre petrol engine which already features in the QX50 SUV, but in the concept is claimed to offer the fuel economy of a diesel with the performance of a petrol. Inside, the Q Inspiration features two digital displays running the entire width of the interior. Both driver and front passenger get their own touchscreens, too. The concept is capable of fully driving itself, including the ability to navigate junctions and on motorways. Fans of the 1968 action film Bullitt will fondly remember Steve McQueen driving a Ford Mustang around the streets of San Francisco. Now, Ford is honouring the Bullitt franchise with a limited-run special edition of the modern Mustang. The Mustang Bullitt comes with 475bhp from its V8 petrol engine, and can reach a top speed of 168mph – increased from the regular Mustang’s 155mph. Special features include bespoke paintwork, 19in alloy wheels and a fake petrol filler cap at the rear. The Bullitt will sit underneath the current range-topping GT350 in the Mustang range, although prices have yet to be announced. Ford’s other big news in Detroit was the announcement that it’s working on a new electric SUV, which will carry the famous Mach 1 name once used on the Mustang. The focus of the new SUV is said to be on performance, and is likely to be a derivative of an existing product – indeed, an Explorer SUV (which isn’t currently sold in the UK) was shown in a promotional video for the project. The Mach 1 forms part of Ford’s plan to double its investment in electric vehicles. A production version of the Mach 1 is due to go on sale in 2020. Its looks may not have changed much, but thanks to new underpinnings this G-Class is both lighter and stronger than the car it replaces. It’s also marginally bigger – meaning more space inside for your passengers and their luggage. Inside, there’s the same dual-screen infotainment and navigation display that you’ll find in the latest S-Class, while luxury touches include heated seats in the front and rear. To start with, you’ll only be able to buy the range-topping G63 performance version of the G-Class, since that is the most popular model in the UK. We’d suggest waiting until 2019, though, when the more frugal G350d model goes on sale. Honda’s Civic family hatchback has been well received so far, earning a credible four stars on our road test. Up until now, though, you’ve only be able to choose from two petrol engines. A 1.6-litre i-DTEC diesel version will go on sale in February, offering drivers who do higher mileages a more frugal option. The new engine is a tweaked version of the previous Civic’s diesel engine, and produces 118bhp, with claimed fuel economy of 76.3mpg and CO2 emissions of 99g/km. The new diesel Civic starts from £20,120/$37,464, and rises to £24,925/$33,898 for a range-topping EX model. The Jeep Cherokee competes against the Audi Q5 and BMW X3, but has thus far failed to match up to those impressive rivals. In fact, the current car gets two stars on our road test. This updated version has been styled to bring it more in line with Jeep’s other models, most notably the Grand Cherokee and Compass, and while Jeep is staying tight-lipped on what engines will be offered, it does say they’ll be more fuel efficient than the current range. A slight rise on the current Cherokee’s starting price of £34,400/$46,785 is expected when sales begin later this year. Mercedes’ performance arm, Mercedes-AMG, is adding a trio of mild hybrids to its range. The CLS, E-Class Coupé and E-Class Cabriolet are the first models to receive the treatment – using the ’53’ moniker – which in each case sees a small electric motor paired with a 3.0-litre six-cylinder petrol engine. The electric motor helps to deliver an extra 22bhp for short periods of time, giving the models extra power away from a standing start or while accelerating. The E53 Coupé now has a claimed 0-62mph sprint time of 4.7 seconds – an improvement over the 5.3-second time of the existing E43 saloon. Each car also comes with a nine-speed automatic gearbox and four-wheel drive. The mild-hybrid setup is planned to be used in more Mercedes-AMG models in the future. Nissan’s six-seat SUV concept previews the Japanese company’s future design direction, so elements from the xMotion’s design could conceivably appear on the next Qashqai or X-Trail. The concept also showcases some of the technology which Nissan will be putting inside its next-generation models, including an infotainment screen which spans the width of the interior. In total, there are seven screens inside the concept.